UPDATE, August 26: While this week was slated to host the final Aeronaut Allston Beer Garden, the Wednesday night pop-up has been extended through September. That said, the closeout celebration was already planned. The “fake finale” on Wednesday, August 31, features Erik van Dam, a Boston-based saxophonist, with a special guest, looping vocalist Margot MacDonald from Washington, D.C.
“Almost all the music at Allston this summer has been locally-focused, but I’d thought we should reach nationally for an act or two! Margot is an unforgettable performer,” says Aeronaut’s arts and culture liaison, Jason McCool. Expect the usual lineup of Aeronaut beers, guest cider drafts, and food trucks. Ever since Ben Holmes, Ronn Friedlander, and Daniel Rassi opened the doors of Aeronaut Brewing Company in Somerville two years ago, they have been thinking about the future. And they think it could be in Allston. This summer, they’re testing the waters with a 16-week, Wednesday night pop-up beer garden at 267 Western Ave., as part of Harvard University’s Zone 3 initiative. 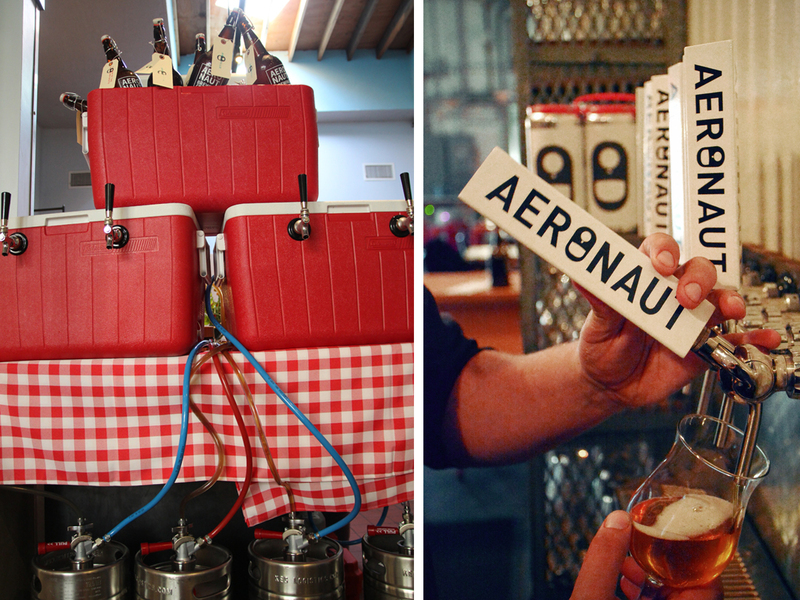 Aeronaut Neighborhood Nights in Allston is an effort to bring those people together. Across two buildings at the Western Ave. site and in an adjacent parking lot, there will be family-friendly activities ranging from free bike tune-ups, to live music, radio broadcasts, open source engineering projects, food trucks, and of course, a cash bar with Aeronaut cans and drafts. The first Neighborhood Night is June 15, with performances by Allston acts Cocek! Brass Band and Strange Changes. The inaugural party will also see all beer sales donated to the Center in Orlando. Aeronaut is fundraising for the LGBT organization in response to the Pulse Nightclub shooting over the weekend, Holmes says. Throughout the summer, the brewery hopes to involve community organizations like CommonWheels Bike Co-Op, Allston Pudding, Allston Village Main Streets, and others, plus Aeronaut’s longtime collaborators, including the Museum of Science. “At this point, we’re calling out for people that want to participate: Bands, designers, community groups that want to be involved,” Holmes says. The Wednesday night pop-ups will also provide a venue for some food truck favorites, including Compliments, the Bacon Truck, Taco Party, and an ice cream tent by the Galley Ice Cream. It’s also a way to gauge the potential of an Aeronaut outpost in Allston. The team has no plans to leave Somerville, but they are considering growing their Boston-area presence, Holmes says. Aeronaut Neighborhood Night in Allston, Wednesday from June 15-September 28, 5-10 p.m., 267 Western Ave., Allston, aeronautbrewing.com. UPDATE, June 13: This post has been updated with information about the Center fundraiser during the June 15 Aeronaut Neighborhood Night in Allston.